The body's natural melatonin production (which declines with age) is responsible for setting the internal "clock" that governs the timing of neuroendocrine functions and other physiological processes. Melatonin has been shown to regulate circadian rhythms and clinically has been used to facilitate adjustment to changing time zones, stabilize mood during seasonal variations in sunlight availability, and to improve sleep. Melatonin production is known to decline with the aging process (BMJ 1994;309:167). Melatonin is effective for helping to promote natural, restful sleep in both younger (Sleep 1998;21:52-68) and older (J Am Geriatr Soc 1996; 44:51) people. Melatonin supplementation has helped reduce the discomfort associated with changing time zone in controlled trials (Chronobiol Int 1998;15:655-66; Biol Psychiatry 1992;32:705-11). 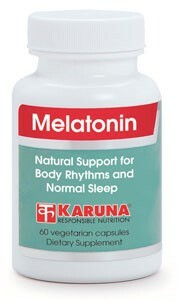 Melatonin helped stabilize mood during the winter months in one controlled trial (Psychiatr Res 1998;77:57-61). Suggested use for adults: One capsule daily taken one hour before bedtime, or as directed.